The exciting flavors of a ceviche marinade work just as well for vegetables as they do for seafood, and it would be a shame for those who don't like seafood to miss out on them! ​Fresh mozzarella cheese replaces the raw fish in this healthy salad, which also has the traditional marinated onions, hot chile peppers, Andean choclo corn, and other colorful vegetables. Slice the onion very thinly into half-moon slices and place them in a bowl of salt water. Add the juice of 1 lime and leave them to marinate for at least 20 minutes. 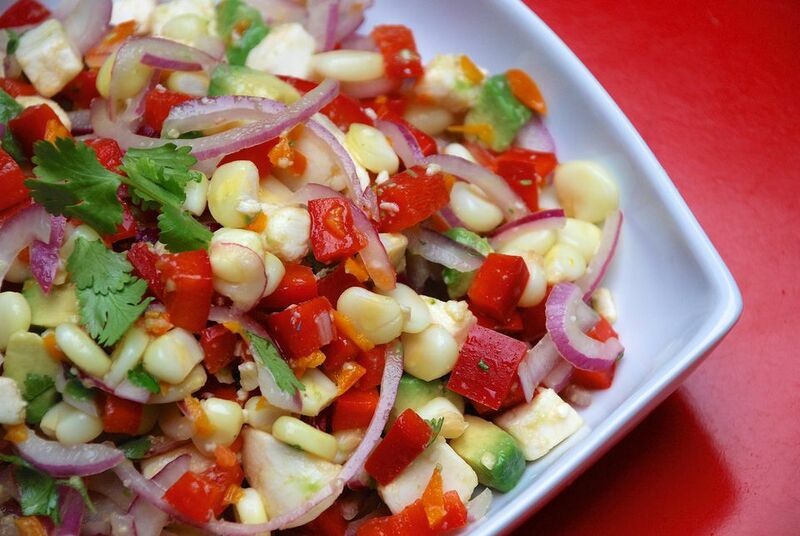 Chop the red pepper and place in a bowl with the corn. Finely chop the chile pepper and toss with the vegetables. Chop the avocado and mozzarella cheese into small (1/2 inch) cubes and add to the bowl. Drain the onions and add to the other vegetables. Toss the salad gently with the juice of the 2 remaining limes, and season with salt and pepper to taste. Marinate salad in the refrigerator for 15 minutes, covered with saran wrap. Coarsely chop the cilantro and toss the salad gently once more, incorporating the chopped cilantro. Serves 2 as a main course, or 4 as a side dish or appetizer.